Though we’ve known about their provisional suspensions since earlier this summer, earlier today the International Olympic Committee officially announced the disqualification of five weightlifters from the 2008 Beijing Olympics. 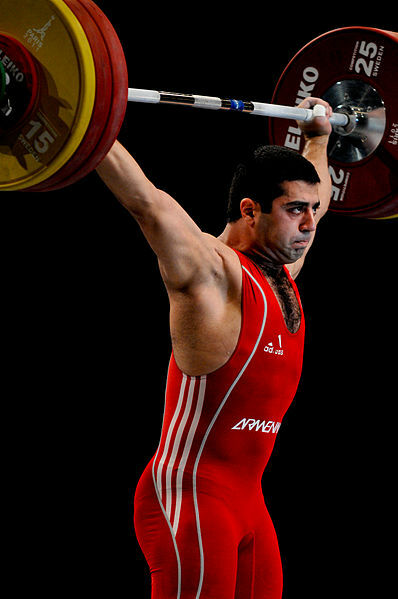 Three of the weightlifters originally won medals in Beijing, and the statement from the IOC specifies that all medals and pins received from the competition must be returned. As per the IOC’s request, the athlete’s national Olympic committee will be responsible for collecting and returning the items. Tigran G. Martirosyan, photo by Kari Kinnunen, Creative Commons. Nadezhda Evstyukhina, Russia, 75kg. Three time World Champion and originally bronze medalist in Beijing. Alexandru Dudoglo, Moldova, 69kg. Originally ninth place in Beijing. Tigran G. Martirosyan, Armenia, 69kg. 2010 World Champion (77kg) and originally third place in Beijing. Marina Shainova, Russia, 58kg. Four time European Champion (thrice at 58kg, once at 63kg), originally second place in Beijing. Intigam Zairov, Azerbaijan, 85kg. Originally ninth place in Beijing. The IOC’s announcement also includes stipulations regarding how prizes must be returned to the IOC and puts responsibility on each athlete’s National Olympic Committee. For example, the following was listed in regard to the return of Evstyukhina’s disqualification. iii. has the medal, the medallist pin and the diploma obtained in the 75kg weightlifting event withdrawn, and is ordered to return these. III. The Russian Olympic Committee shall ensure full implementation of this decision. IV. The Russian Olympic Committee shall notably secure the return to the IOC, as soon as possible, of the medal, the medallist pin and the diploma awarded in connection with the Women’s 75kg weightlifting event to the Athlete. V. This decision enters into force immediately. No statement has yet been made regarding the 15 weightlifters implicated in a second round of doping retests announced earlier this month. If their positive doping results are upheld, though, it’s likely they’ll face the same penalties as the five lifters disqualified today. Featured image: Tigran G. Martirosyan, photo by Kari Kinnunen, licensed under Creative Commons Attribution-Share Alike 2.0 Generic license. Creative Commons Attribution-Share Alike 2.0 Generic license.